My favorite album cover is Talk! No, no, no-just kidding! It's real close but I'd have to take Drama over Relayer. No question about it. It's both Tales and Relayer. /. I can't decide which. As a snake fan I may be partially inclined towards realyer, and the whole concept is generally better, but the inside of CTTE is uber-cool (But if the decision was only based on the OUTER covers then the winner is obvious). Looks like I missed this thread, as activity had died down back in 2002 before I joined Yestalk! My personal favorite is Tales, as far as the outer packaging goes. 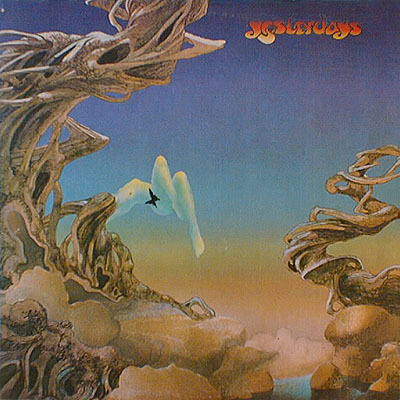 If you're talking the package as a whole, then Tales is still excellent, but you also have to give nods to Yessongs, for its four paintings and the interior booklet, and CTTE for the interior painting and those calligraphic lyrics . . . how often I listened while perusing those! And Relayer is so wonderful too . . . the detail is just gorgeous . . .
All the Dean stuff amazes me . . . I remember purchasing Views back in the 70's when it wasn't available except by import, and I finally found a bookstore willing to import it for me . . . sat mesmerized at all those beautiful images all in one place . . .
but I like Talk too - no seriously, I found out recently its by a guy called Peter Max, who's a bit of a legend. i didnt get it before, but it has a wondrous simplicity. Dean is a master, tho, it has to be said. my least favourite, why that would be Tormato - before it got splatted..